Keeping a garden journal is one of those things that we start enthusiastically, but always let fall by the wayside. Once things start growing, it's hard to remember to take notes. But there's nothing more useful than notes and photos you took during the gardening season. You can look back and see what problems you had and when, what plants grew well, and even what plants have disappeared. Here's an easy method for keeping track of what you planted and where you planted it. It won't necessarily answer all your questions, but you will at least know where and when you put in certain plants that you want to keep tabs on - information that comes in really handy when you lose a plant. 3-Ring Binder: Any type of binder will do. 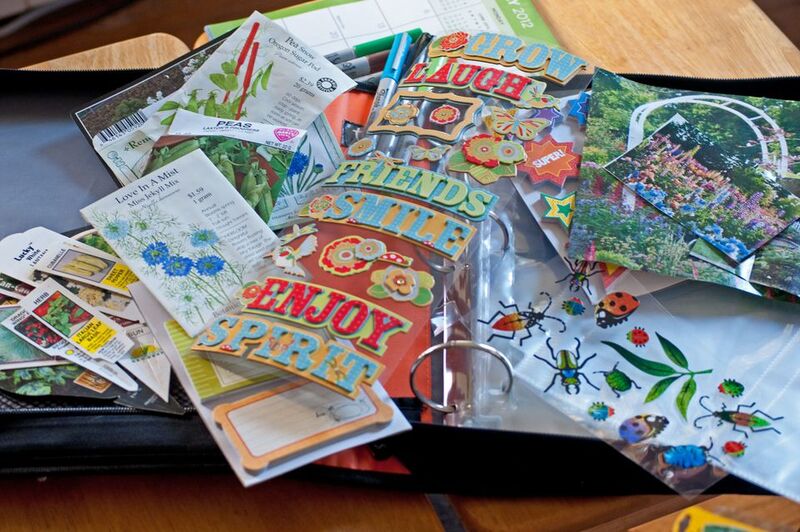 If you plan on taking it into the garden, a vinyl binder is your best bet. A binder that zips closed makes it handy to slip things into it in a hurry and not worry about them falling out. It's also nice to have a cover that allows you to slide in a photo of your garden or a favorite plant or container. Plastic Photo Sleeves: The plastic sheets are relatively inexpensive and available at discount and craft stores. Sleeves sized-for baseball cards are available in bulk, but they're a little small for most seed packets. Get them in assorted sized pockets, for tags, seed packets, and photos. Blank Pages: Keep some black pages in the back of your journal for additional notes. If you make notes elsewhere, you can always tuck them into a sleeve. Permanent Markers - You will want at least one fine point, for longer notes. Plant Tags and Seed Packets - Collect them as you plant. Calendar - More on this later. Photos of Your Garden - Be sure to take shots of both the good and the bad. Often we don't think to photograph diseases and insect damage, but these are important notes to be taking. Once you have all your supplies gathered, it's simply a matter of tucking things in sleeves. Save all your plant tags and seed packets and slip them into the sleeve pockets. To make it easier to find the plant you're looking for, keep each garden bed or section of the yard in a separate sleeve. Now that everything is in one place, the next step is to start taking some notes. The tags and packets instantly give you information on what you planted. You can see through both sides of the sleeve, so you'll have the plant identification as well as all the growing notes. Use your permanent markers to makes further notes. For starters, you can mark the bed or area of the garden right on the plastic sleeve. You can also make notes about things like when something was planted, where it came from, when it first bloomed, or how much you harvested. A fine tip marker is all you'll need to get started putting your journal together. Of course, if you'd like to get more creative with markers, stickers, and other craft store items, go for it. If you've included a calendar, you have a handy reference for noting all the plants the were planted/harvested/pruned/blooming on a specific day. Adding photos to your journal is not just a great way of tracking your garden's progress; they also help trigger your memory months and years after your journal was started. As your garden starts to grow, snap and print shots of great combinations and favorite scenes. You can shoot the same area at different times, to see the progression. Take shots of containers you'd like to duplicate. Try the old black and white photo trick, to see how things look without the distraction of color. Photos are a nice place to jot notes about plants that need dividing or moving and colors that clash or just aren't right. Photograph pests and diseases, to keep track of problems. And don't forget to take shots of problem areas, to study and correct during the offseason. No one has to see them but you. I'm sure you'll come up with many more uses for your garden journal. It will be invaluable when it comes time to order more seeds or plants. And if you should ever decide to move, you will have a convenient way to pull together a plant list for the new owner of your garden. For ornamental gardens, it's nice to make a new journal each year, as you try new plants. Since we tend to plant many of the same plants every year in the vegetable garden, you might want to consider a perpetual journal. The tags and packets will still go into sleeves, but you can keep a running list of notes, year to year. Let your gardening journal evolve to meet your gardening style.